Hi Guys! In this weeks post I am writing about what happens in our body when we get anxious. This is particularly useful for those who suffer with panic attacks, as these anxiety symptoms can be misinterpreted during a panic attack. Panic attacks are very frightening and can come with scary psychical sensations that can understandably get mistaken for something psychically wrong. Knowing what happens in our body when we get anxious can help ease out concern and even prevent the anxiety from turning into a panic attack. Anxiety is energy to fight if you believe you can beat the threat, flee if you think you can out run it or freeze and play dead if you don’t think you can do either (the fight or flight response). This is why anxiety can sometimes be perceived as a threat. Chest tightness, pain, heart palpitations: The belief of vulnerability to heart attacks. Breathlessness, smothering sensation, irregular breathing: The belief of possible suffocation and death. Dizziness, light-headedness, faintness: The belief of losing control and doing something embarrassing or of going crazy, or presence of a brain tumor. Nausea, abdominal cramps: The belief of vomiting uncontrollably. 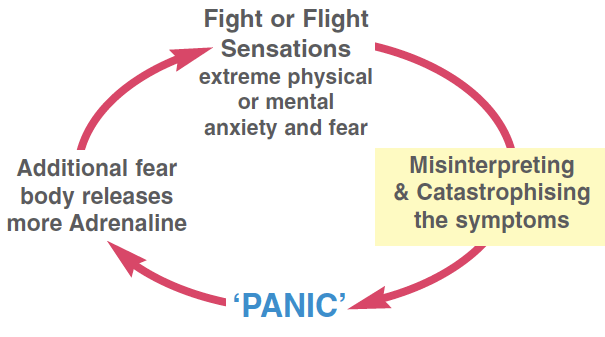 Restless, tense, agitation: The belief that these symptoms are an indication of losing control which could lead to a severe panic attack and eventual loss of function. Feel shaky, trembling: Belief these symptoms indicate a loss of control and are often a precursor to severe panic. Forgetful, inattentive, loss of concentration: The belief of losing control over one’s mental functioning and ending up losing cognitive function. Feelings of unreality, depersonalization: The belief that these symptoms may indicate a seizure or of going crazy. Gastrointestinal symptoms (stomach pain or discomfort): I’m going to vomit; I’m going to lose control of my bowels.